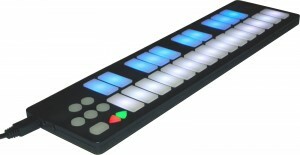 Today must be MIDI day, as this is the second MIDI product that I am reviewing today. I will have to admit, I am not musical enough to really use these products in my career, but this doesn’t mean that I can recommend this to those who want to be. Now, I have reviewed products from Keith McMillen Instruments before. I absolutely loved the QuNeo, and recommend it for anyone who even just wants to try DJing. The QuNexus is a different kind of animal as it is a MIDI keyboard controller with about 25 pressure sensitive smart sensor keys. They have that LED illumination thing going on like the QuNeo, and they can detect weird things like finger pressure, tilt, and velocity which translate to pitch bend and modulation in each key. The QuNexus is designed to plug into all mobile devices with no additional drivers needed. Speaking of mobile, the QuNexus is made for it. Seriously, you can probably drop it and it is still good. I didn’t try it with the one that I tried out, because I’ve got problems with damaging goods that I review. All in all, the QuNexus is good for portability and playability. Now, that is a quote of the website by Matthew Dear saying essentially the same thing, so all I can do is simply agree with it. You should be able to get it for about $149.00.